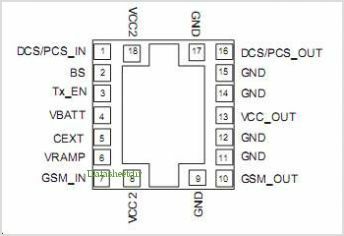 GSM850/GSM900/DCS/PCS Quad Band Power Amplifier Module With Integrated Power Control,As with previous generations, the AWT6166 integrated CMOS power control scheme simplifies the design of the transmitter by eliminating the need for external power control circuitry. The AWT6166 input and output terminals are internal matched to 50 ohms and DC blocked, reducing the number of external components required in the final application. Both PA die, GSM850/900 and DCS/ PCS, are fabricated using state of the art InGaP HBT technology, known for it is proven reliability and temperature stability. By Anadigics, Inc. This is one package pinout of AWT6166,If you need more pinouts please download AWT6166's pdf datasheet. 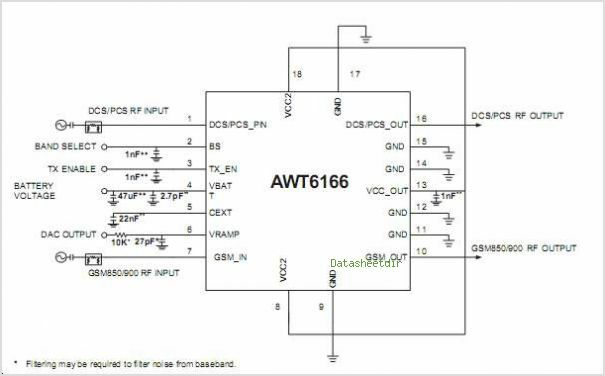 This is one application circuit of AWT6166,If you need more circuits,please download AWT6166's pdf datasheet.